one VFO’s output routed to your computers audio card and the other 7 VFOs to virtual audio cables using a 3rd party virtual audio cable program to other software applications. The VFO can also be routed to the FDM-DUO’s internal audio interface output. The audio can be routed using several modes, IF at either 192 or 48kHz and WBFM Mux. Each VFO can even have it’s own CAT support assigned to it either using a hardware serial port or virtual serial port assigned to it. This is sort of a unique feature. This would allow a 3rd party program to control just that one VFO, which could lead to some interesting applications considering the wide bandwidth of the FDM-DUO. Omnirig is supported so that you can have the FDM-SW2 software control an external legacy radio or other device. A common application would be to allow the FDM-DUO / FDM-SW2 act as a spectrum display for a legacy radio. The Tmate series of external controllers are supported by the FDM-SW2 software. The Tmate2 controller pretty much mimics the front panel of the FDM-DUO. These controllers would allow you to have a physical controller for the FDM-SW2 software. However with the FDM-DUO you sort of have a less powerful version of the Tmate2 external interface. This is a very nice feature that can place information on the spectrum identifing a signal by call sign or station name and can be found under the Set / Station Memory Tab. The label placement can be configured in a few different ways as to where and how they are placed. CW Skimmer can be interfaced to the FDM-SW2 software by using CW Skimmers’ Telenet interface. Live call sign data from CW Skimmer will be shown over the actual signal in the spectrum display. This is pretty handy for quickly tuning to and working a CW station. The FDM-SW2 also has a built in DX Cluster interface. This will allow a reported DX station callsign and frequency to be reported in the memory box on the main screen and on the spectrum display. By clicking on the frequency in the spectrum display or the memory box, you can go directly to that station. If other stations happen to popup in the same slice of bandwidth you are using you will automatically see their call sign appear. If a station pops up on another and, you can use to the memory box to get there immediately. You can also set a time period for the station information to “age” off the screen to keep old reports from stacking up. 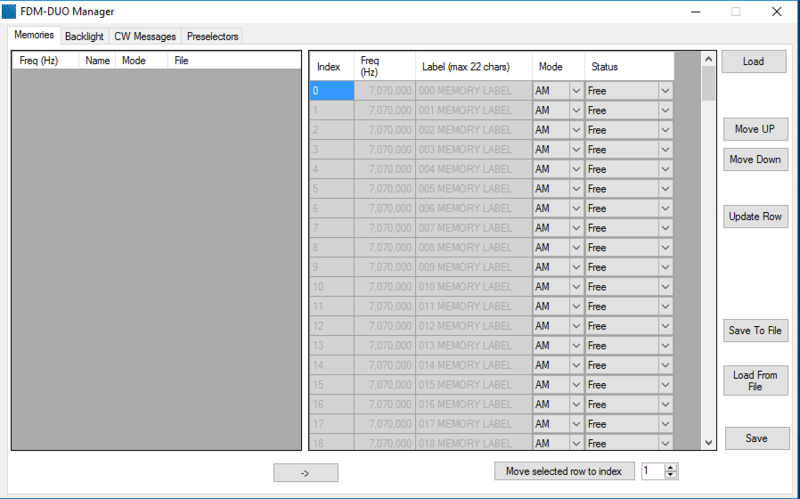 The DX Cluster feature of the FDM-S2 is an incredibly useful tool for chasing DX. 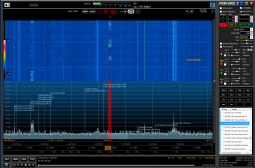 If you are a Shortwave listener you might find the EIBI database feature useful. You can download a current database of various types of SW radio stations frequency and names. This file can then be imported into the FDM-SW2 software and displayed in the spectrum display. Well, you could just transmit just by reaching over and grabbing the included PTT microphone plugged into the FDM-DUO, but that wouldn’t be any fun. 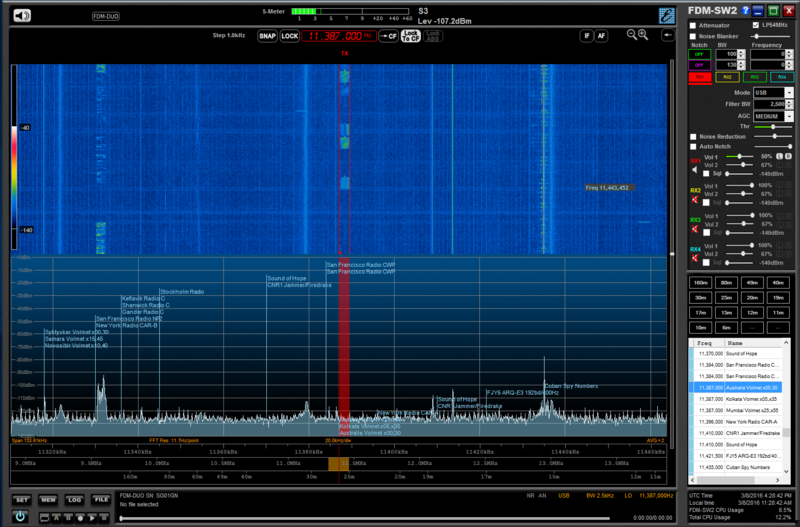 Since we have an SDR transceiver here, we can play with things a bit. 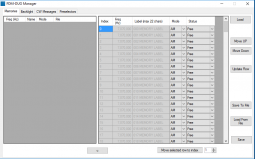 By clicking the small TX button under the frequency display you can access the transmit portion of the FDM-SW2 software. Depending on the mode selected you can select which device you want to use for transmit. For CW you can select between a CW key or Paddle. In voice modes you can select either the mic plugged into the FDM-DUO or a Mic plugged into the computer’s USB port. By selecting the ADV button an Advanced TX panel will open containing transmit settings. You can pick which audio device you want to use for transmitting. For example if you had a USB desk mic plugged into your computer and a USB headset mic. you could choose which mic to use. Up to four audio files can also be assigned to four buttons. These could be used for applications like calling CQ. The file can also be set to auto repeat. Output audio can be customized with a provided 7 band equalizer. 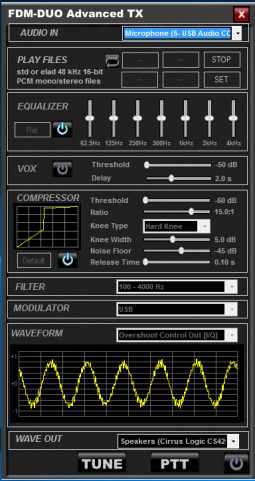 There is a Vox mode that can be turned on with settings for Threshold and Delay. 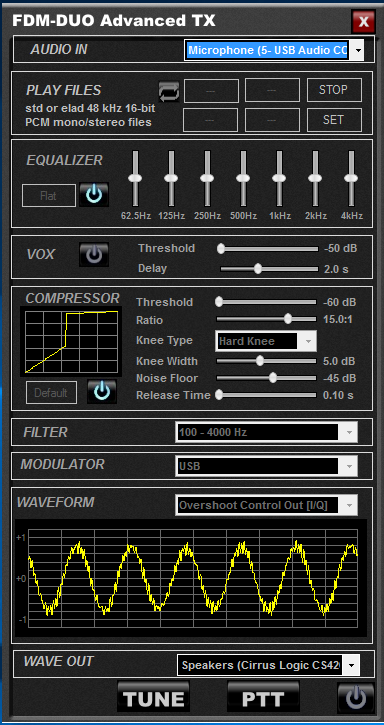 The compressor can be turned off or on and tweaked to your liking. There are a few other tweaks you can do regarding the transmit filter settings and overshoot control. Also included is a nice little Waveform display to see your audio. Plus a selection to let you choose where to send the audio making it possible to send it on to other audio processing software before going out the radio. At the bottom of the panel is a large Tune button and PTT button. There is also a power button to turn off the panel in case you want to leave it up but temporarily disable the transmit features.